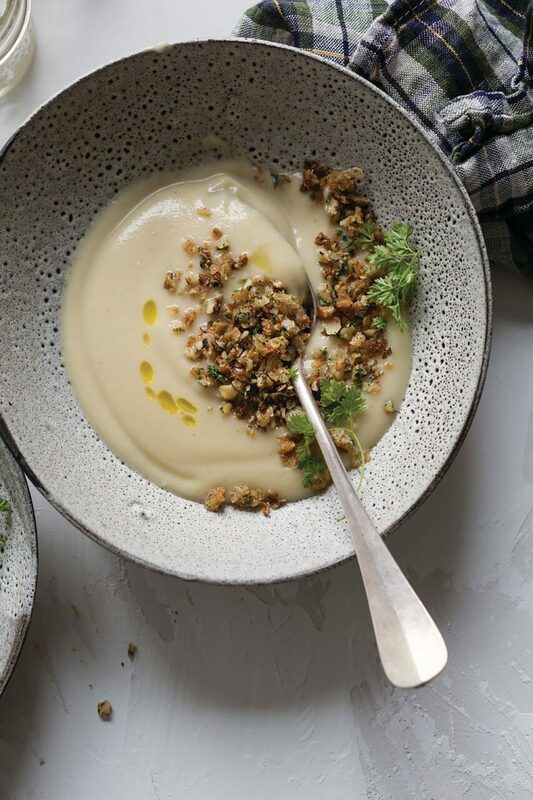 This creamy, delicately flavored, dairy-free gluten free soup gets an exciting pop of flavor and texture from its crunchy-salty walnut-anchovy breadcrumb topping. FYI, sunchokes look a bit like rotund ginger, but the knobby tubers also known as Jerusalem artichokes have a mildly artichoke-like flavor. They’re also high in fiber and low in calories and are available seasonally at farmers’ markets and well-stocked grocers. In a cast-iron pot over medium-high heat, warm 3 tablespoons of the olive oil. Add the onion, garlic, and fennel seeds. Cook, stirring occasionally, until softened and translucent, about 5 minutes. Add the celery, thyme, celery root, sunchokes, potato, chicken broth, and 1 teaspoon salt. Bring to a boil, reduce the heat, and simmer, covered, until the vegetables are tender, 25 to 30 minutes. Puree the soup in a blender, and season to taste with salt and pepper. Meanwhile, toast the gluten-free bread until it is dry and a little golden. Pulse it in the food processor to coarse crumbs or cut into small pieces. In a sauté pan over medium-high heat, warm the remaining 1 tablespoon olive oil and the anchovies and cook, avoiding oil splatter, until the anchovies are broken down, 30 seconds. Add the breadcrumbs and toss. Remove from the heat, add the walnuts and chopped parsley, and toss to combine. Ladle the hot soup into bowls, top with the walnut-breadcrumb mixture, and serve.